From several posts inside stackoverflow and outside, I have come to know how to detect cycles in a linked list, the length of a cycle. I also found the method on how to detect the start of the loop. Here are the steps again for reference. Have two pointers, classically called hare and tortoise. Move hare by 2 steps and tortoise by 1. 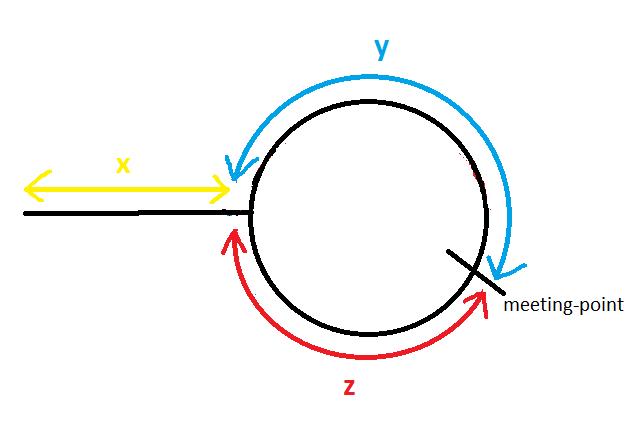 If they meet at some point, then there is surely a cycle and the meeting point is obviously inside the cycle. Keep one pointer fixed at meeting point while increment the other until they are same again. Increment a counter as you go along and the counter value at meet will be the length of cycle. Take one pointer to start of the list and keep the other at the meeting point. Now increment both by one and the meet point is the start of loop. I verified the method using some cases on paper, but I don't understand why it should work. Can someone, provide a mathematical proof as to why this method works? You can make your 'Find the start of cycle' proof simpler if you don't use meeting point. This way, proof is pretty obvious. When the first pointer reaches start of the loop, second will be exactly M steps ahead: also at the start of the loop. Declare two pointers (pFast) and (pSlow). Make pSlow and pFast point to list. If , then STOP as a loop has just been found. If this point has been reached (one or both two pointers are NULL) then there are no loops in the list. Note how every node, except the one pointing to the begining of a loop, is labeled with the number of its target minus one. So, if one node is labeled with i and it is not the begining of a loop, then it is pointed as next element by the node labeled with i-1. The algorithm explained above can be described as a loop since its main step (3) is a set of sub-steps which repeated until the exit condition is satisfied. That forces us to represent pFast and pSlow in function of the iteration number in the algorithm execution (t). If one pointer is indeed enough to detect loops using the algorithm described, then it must exist at least a solution to the equation . Thus It is proved that one slow pointer and one fast pointer are enough to detect loop conditions in a linked list. Since fastPointer travels with double the speed of slowPointer, and time is constant for both when the reach the meeting point. Hence by moving slowPointer to start of linked list, and making both slowPointer and fastPointer to move one node at a time, they both have same distance to cover . Start F as Fast ans S as slow than they end up meeting at at 9 . Now when I start the S from start again , than it will reach at start of the loop i.e. 7 but f will be at 16 .. The second part, stating that "to find the start of the loop, just move one pointer back to the start of the list then iterate both until they meet" is wrong! It is correct only if the fast pointer has gone round the loop exactly once - i.e. that the portion before the start of the loop is shorter than the length of the loop - but if it is longer then the algorithm doesn't work; you can get stuck in an infinite loop. /* Algorithm : P2 is moving through the list twice as fast as P1. Not the answer you're looking for? Browse other questions tagged algorithm linked-list or ask your own question. Explain how finding cycle start node in cycle linked list work? How can we find the starting node of a loop in link list? Cycle Detection Algorithm: Is there a condition for Tortoise and Hare to enter into cycle?